The Juneau Icefield Research Program student program is built around a 75 mile/120 kilometer traverse of the Juneau Icefield. The Icefield covers the border between Southeast Alaska and northwest British Columbia. Students and staff cover the entire distance on foot, traveling over hiking trails, on crampons, and by ski from Juneau, Alaska to Atlin, British Columbia. All 35 students and 10-15 staff travel between camps at roughly the same time (spaced out over a couple days and divided into small trail parties), and then everyone works out of the same major field camp for 10-14 days. This breaks the summer up into four blocks, one at each major camp, and four sets of “traverse days”, when most people are focused on opening and closing camps and traveling between camps. The Icefield camps are numbered in the order in which they were established, beginning in the late 1940s. The traverse route has changed over the years and not all the camps are still in use, but we still use the original names. As a result, the order of the camp numbers can feel a bit arbitrary at first. This is one of the many quirks of Icefield living that keeps us connected to the history of the program. The following summary of the summer is broken up into the blocks and the traverse sections. If you’re curious about what to expect of the traverse or which block may the best for your teaching or research needs, the Block Schedule will be most helpful. If you’re considering staying for more than one block or applying to do the whole traverse as student or staffer, the traverse summaries will be helpful. Location map of the Juneau Icefield, in the Coast Mountains, straddling the border between Southeast Alaska and northwestern British Columbia. 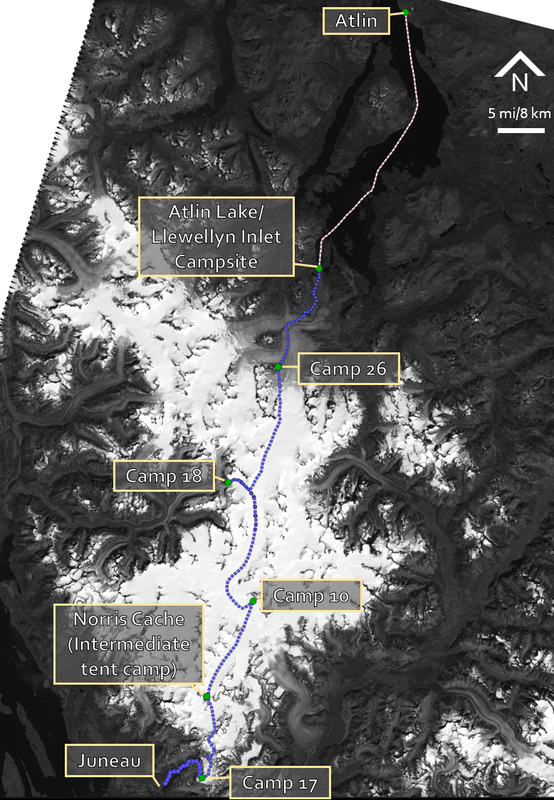 A map of the Juneau Icefield traverse and the major Icefield camps. Credit: Allen Pope.